San Francisco, Calif., June 11, 2018 — Virtual reality (VR) is here to stay, and its potential is already changing the field of learning and development (L&D). 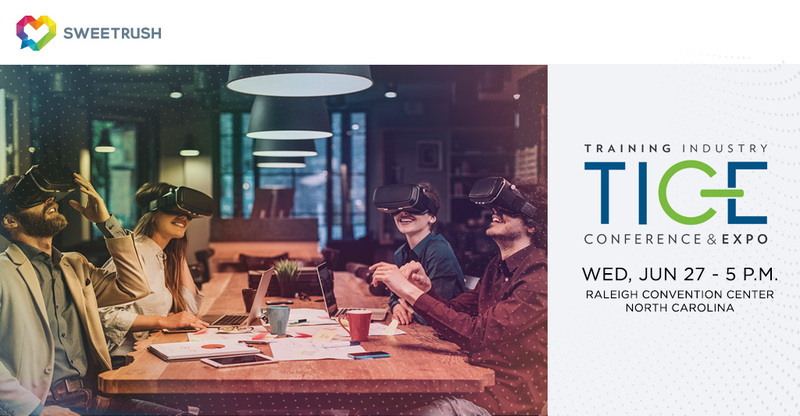 As part of its efforts in developing emerging technologies, SweetRush host a VR presentation at the Training Industry Conference & Expo (TICE), called “Virtual Reality: A Real-World Hilton + SweetRush Project Case Study” on Wednesday, June 27, at 5:00 p.m., to be held at the Raleigh Convention Center in North Carolina. SweetRush Creative Director Justin Mitchell, who has a strong background in emerging technologies, will present with Farrah Brown, Director of Global Learning and Talent Development for Hilton—who has over 15 years of experience in L&D. The speakers will take learning professionals on a journey through the creation of Hilton’s business simulation during this VR presentation. Read more about the VR presentation at the Training Industry Conference & Expo on SweetRush’s website. We are over 150 people strong and have been in business since 2001. Every day, we give thanks for the trust of our world-class clients. Our deliverables span from analysis and curriculum mapping to the creation of blended training products, including live and virtual classroom training, custom-developed eLearning, and innovative use of emerging technologies.